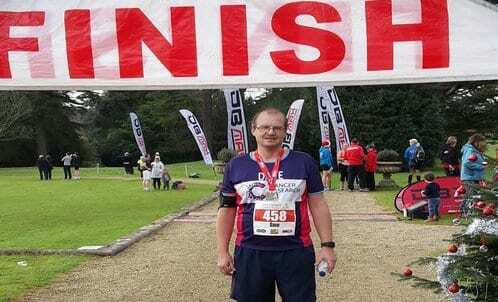 This week it’s Dave Hyde who took part in the Westonbirt 10K with us last year. “I have been running for 20 months now, slowly building up to a standard which has well exceeded my expectations so I am really enjoying it. Last year I decided that I want to run but also fund raise and Cancer Research is very close to my heart, having lost my Dad a couple of years ago to cancer. This hit me very hard and also lost a good friend at a very young age to Testicular cancer. I started out in January at a Bath Mud trial and have completed many events last year (14 in total). The Great South Run 10 miler was my target for the year but out of stupidity I entered the Bristol Half Marathon which was a massive success for me personally and very rewarding. I have entered Bath half with a silver place raising money for the Forever Friends appeal at Bath Royal united Hospital.